The CKT-TF1525e is based around the 15″ bass/midrange driver of the same name; the CKT-TF1225 system likewise begins with the 12″ TF-1225 driver. On the 15″ system, the CDX-1747 polyimide diaphragm HF compression driver is loaded onto Celestion’s H1-9040 horn, which provides 90 degrees (horizontal) by 40 degrees (vertical) dispersion for treble detail across a wide soundstage. 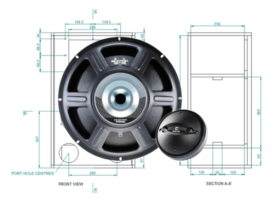 The 12″ system combines the best-selling CDX-1745 driver with the same horn. The CKT-TF1020 floor monitor pairs the 10″ Celestion TF-1020 bass/midrange driver with the CDX1-1445 compression driver, which is loaded onto the H1-7050 horn. The 70×50 horn ensures good dispersion of treble frequencies in both the horizontal and vertical planes delivering superb HF performance regardless of whether the cabinet is placed upright or on its side as a floor monitor. Previous articleMajesty 6 String Majestic Purple Incoming!